An observant MobileRead member noticed that Fictionwise seems to have quietly stopped mentioning the Ebookwise 1150. Came across something that seems odd. I was gathering information together to sell my eb-1150 and noticed there's no longer any information on the Fictionwise site regarding the eb-1150. I then went to the eBookwise site and went to my download library and came across this message. "Future purchases at Fictionwise will not be available for upload." I've looked, and I can confirm these details. 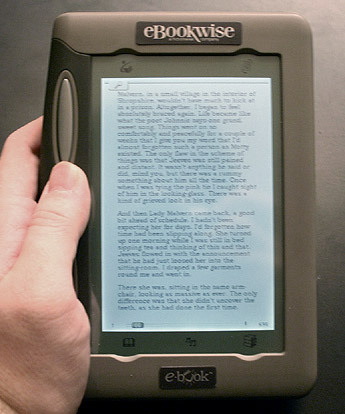 On the other hand, the eb-1150 is still for sale on www.ebookwise.com. Oh, and I would try to contact Fictionwise and ask, but they stopped talking to the press shortly after they were bought by B&N. I happen to still have an 1150 in the original retail box. I pulled it out, and would you believe it was made in 2002? The hardware is 8 years old, and still being sold. Impressive. I’m keeping it. You can probably still find it on Ebay.